What Are the Effects of Boiling & Freezing on Enzyme Activity? What Happens to Enzyme Activity if the pH Is Unfavorable? What Are the Two Ways to Inhibit Enzyme Activity? Enzymes are proteins that only perform their functions when their three-dimensional shapes are intact. Therefore, understanding the structure of enzymes will help clarify the ways in which enzyme activity can be inhibited. Drastic temperature changes, such as melting or freezing, can change the shape and activity of enzymes. Changes to the pH, or level of acidity, of the enzyme’s surroundings can also change enzyme activity. Enzymes are proteins, meaning they have a specific three-dimensional structure that defines their catalytic activity. The primary structure of a protein is its amino acid sequence. The secondary structure of proteins is the hydrogen bonding that occurs along the backbone of the amino acid sequence. The tertiary structure of a protein, which is where an enzyme’s activity comes from, is held in place by the intra-molecular (within a molecule) interactions of the amino acid side chains. The interactions that maintain the tertiary structure of an enzyme are affected by temperature and pH. 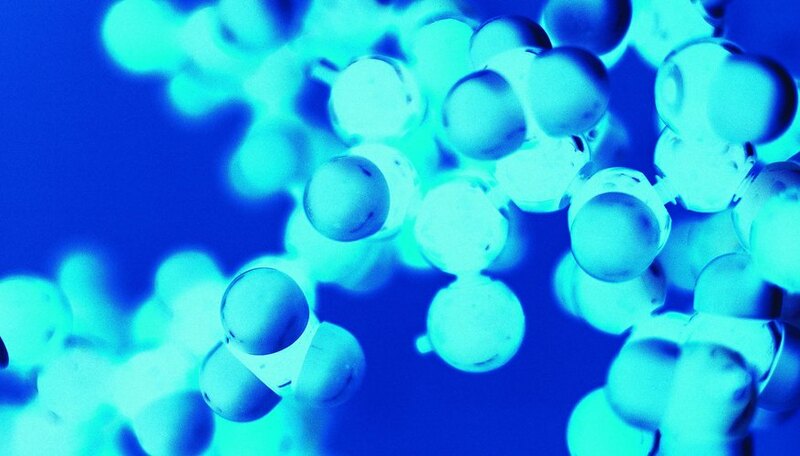 Enzymes are made of chains of amino acids, which are made of atoms. Atoms and molecules naturally vibrate, but too much vibration causes enzymes to unfold. One type of temperature change that inhibits enzyme activity is heating. Raising the temperature causes the molecules to vibrate faster. But when the temperature increases too much, the enzyme unfolds. This unfolding, called denaturation, makes the enzyme lose its three-dimensional shape and thus activity. Most animal enzymes are not functional above 40 degrees Celsius. The second type of temperature change that affects enzyme activity is cooling or freezing. Just as increasing the temperature makes molecules vibrate faster, lowering the temperature slows the vibrations. When the atoms in the enzymes slow too much, or if they freeze, the enzyme cannot perform its function. Enzymes are not rigid machines, even though they have a physical structure. The atoms in enzymes, like other proteins, normally vibrate. They need this flexibility to perform their function, and freezing stops them from moving at all. Aside from temperature changes, an alteration in the acidity, or pH, of the enzyme’s environment will inhibit enzyme activity. One of the types of interactions that hold an enzyme’s tertiary structure together is ionic interactions between amino acid side chains. A positively charged amine group is neutralized when it interacts with a negatively charged acid group. A change in pH, which is a change in the amount of protons, can change the charges of these two groups, making them un-attracted to each other. It should be noted that each enzyme functions within a specific pH range, some liking very acidic environments, others very alkaline, or basic, environments. David H. Nguyen holds a PhD and is a cancer biologist and science writer. His specialty is tumor biology. He also has a strong interest in the deep intersections between social injustice and cancer health disparities, which particularly affect ethnic minorities and enslaved peoples. He is author of the Kindle eBook "Tips of Surviving Graduate & Professional School." How Does pH Level Affect Enzyme Activity? H., David. "What Are the Two Ways to Inhibit Enzyme Activity?" Sciencing, https://sciencing.com/two-ways-inhibit-enzyme-activity-11541.html. 25 April 2017. Enzymes: What is it? & How Does it Work? What Is the Optimum pH for Human Stomach Enzyme Activity?